In a world where empathy and kindness seem to be harder to come by each day, the most valuable thing you can give your child this holiday season is the gift of compassion. Yes, seriously. OK, fine, your kid wants that cheap Troll doll that smells like toxic chemicals, and it’s totally fine to get them that. (Parents are all pushovers to some extent, right?) But why not aim to also weave an act of charity into your holiday gift giving? Because the truth is, helping others isn’t just a nice thing to do; it also helps prime the next generation of do-gooders, a cohort that actually cares about their neighbors and the larger world around them. What a novel idea! Plus, it’s proven that acts of selflessness are actually inherently selfish in the best possible way. Quite simply, helping others makes you happier. Here are five “gift” ideas to help teach kids compassion this holiday season — and their whole lives. It’s one thing to tell your kid to care about others who are needier (who hasn’t thrown the “there are children starving somewhere; finish your dinner!” line at their kids? ), but it’s quite another to actually show them how to care. Sign up to volunteer with your child somewhere — maybe it’s serving dinner at a soup kitchen, running a shift delivering meals to those who can’t make it out of their homes or even cooking for families at your nearest Ronald McDonald House. Or perhaps it’s reading to someone at their hospital bed or handing out drawings to residents at a nursing home. 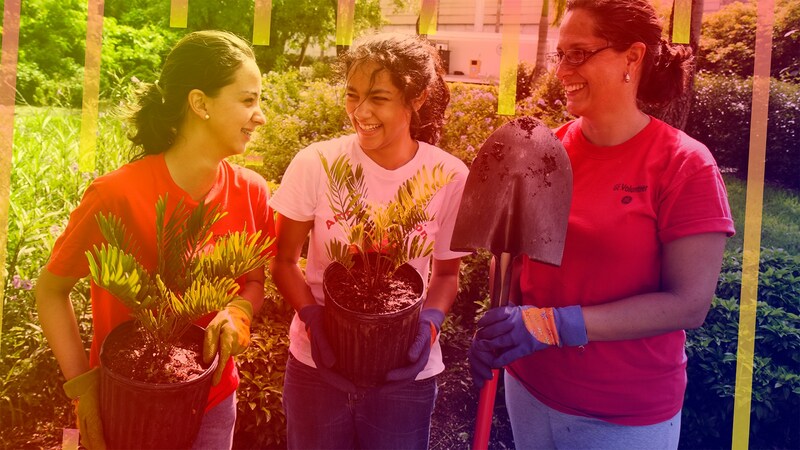 You can help build a playground or a home or volunteer to help clean up a neighborhood — your own or elsewhere. The possibilities really are endless. Choose a volunteer activity that either matches your child’s interests or one that puts them out of their comfort zone, and you’ll be gifting kiddo with perspective and warm fuzzies. Rather than giving your kid yet more toys — which they will likely play with once and then throw on the floor for you to clean up — turn the equation around this year. Have your child go through their toys and pick out the ones they don’t want anymore. Then let them pick out a charity with you and drop the toys off together. And if they get to meet some of the kids they’re helping? All the better. You can even expand the opportunity by collecting toys from friends and neighbors as well and do a big drop-off together with your kid. What better way to help your child appreciate the roof over their head? Team up to support the many disaster-relief efforts currently underway. There’s Puerto Rico and other areas ravaged by hurricanes, Mexico under the weight of two massive earthquakes, India’s mudslides, California’s wildfires, Syria, Yemen and Nigeria in wartime… There is, sadly, no shortage of causes around the world that need our help. Use the opportunity to help your child think creatively about how to raise awareness, funds or supplies for those in need — and help them carry out their plan to make a difference. Give your child $100 and let them go crazy at the dollar store buying supplies for those in need — whether that’s refugees or natives of your own city. A hundred dollars can go a long way at a discount store; you’d be surprised how many tubes of toothpaste, deodorant, pairs of socks, gloves and hand warmers, packages of nuts and shelf-stable food and drinks you can purchase. Spend quality time with your child assembling the care packages and pick an area or few areas where you can go hand them out, either at a shelter or simply on the street. You’d be surprised how many people appreciate the thought and care and how much your child will learn from the exercise. You can turn your holiday meal leftovers into packages to add to the mix — and maybe even make it an annual ritual. Any kid would be lucky (and likely would love) to go to the Dominican Republic or Grenada, for example. Sure, you can spend some time lying on the beach — and then you can spend some time volunteering at a local orphanage, teaching kids to play ball or speak English, helping to clean up a beach or working on coral reef restoration. There are so many opportunities for vacations that are both fun and meaningful, and it’s never too early to teach kids the two don’t have to be mutually exclusive. No matter how much your kid begs for that video game or iPhone or doll, giving the gift of compassion — of using any power or privilege they have for good and to help others — will go eons further in equipping them to become upstanding adults. They may not thank you right away, but they’ll definitely be grateful down the line — and you may just surprise yourself by discovering how much capacity for compassion your kids already have, even at young age. And Lord knows we all need more of that these days.